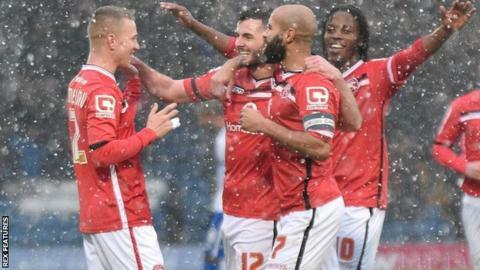 Walsall held off a spirited second-half fightback from Bury to move up to second in League One. The Saddlers led 3-0 at the break as Chris Hussey put into his own net, Tom Bradshaw fired in and Anthony Forde added a good finish. Leon Clarke cut the deficit to 3-1 when he converted John O'Sullivan's cross before he scored again less than 90 seconds later with a tap in. The former Wolves man nearly got his hat-trick but hit a post late on. "The goals are extremely poor in terms of individual errors. "If you want to attack as a full-back, I love attacking full-backs but never forget your duty as a defender. "We've not competed first half to levels that I want to. "You can work at getting better at your job and improving your profession and that is what I keep telling the group." "I thought it was exciting first half for us. They had to change, 3-0 down at half-time, at home. "They put on another striker, and in the conditions just got the ball forward. "We would've liked to have kept a clean sheet, but credit to them, they put the ball in dangerous areas and it's difficult to defend." Match ends, Bury 2, Walsall 3. Second Half ends, Bury 2, Walsall 3. Attempt missed. Kieron Morris (Walsall) left footed shot from outside the box misses to the left. Attempt missed. Kelvin Etuhu (Bury) right footed shot from outside the box misses to the right. Corner, Bury. Conceded by Andy Taylor. Substitution, Walsall. Matt Preston replaces Tom Bradshaw. Substitution, Bury. Tom Pope replaces Andrew Tutte. Corner, Bury. Conceded by Anthony Forde. Attempt missed. Danny Mayor (Bury) left footed shot from the left side of the box is high and wide to the left. Leon Clarke (Bury) hits the left post with a right footed shot from the right side of the box. Corner, Bury. Conceded by Sam Mantom. Corner, Walsall. Conceded by Chris Hussey. Nathan Cameron (Bury) wins a free kick on the left wing. Corner, Bury. Conceded by James O'Connor. Attempt blocked. Danny Rose (Bury) right footed shot from the right side of the box is blocked. Corner, Walsall. Conceded by Reece Brown. Attempt blocked. Anthony Forde (Walsall) right footed shot from the centre of the box is blocked. Ian Lawlor (Bury) is shown the yellow card for dangerous play. Attempt blocked. Andy Taylor (Walsall) right footed shot from outside the box is blocked. Goal! Bury 2, Walsall 3. Leon Clarke (Bury) left footed shot from very close range to the bottom left corner. Goal! Bury 1, Walsall 3. Leon Clarke (Bury) left footed shot from the left side of the six yard box to the bottom left corner. Assisted by John O'Sullivan. Rico Henry (Walsall) wins a free kick in the attacking half. Danny Rose (Bury) is shown the yellow card for a bad foul. Foul by Danny Rose (Bury). James O'Connor (Walsall) wins a free kick on the right wing. Andrew Tutte (Bury) wins a free kick on the left wing. Delay in match John O'Sullivan (Bury) because of an injury. Second Half begins Bury 0, Walsall 3. Substitution, Bury. Danny Rose replaces Jacob Mellis. First Half ends, Bury 0, Walsall 3. Attempt saved. Jacob Mellis (Bury) left footed shot from outside the box is saved in the centre of the goal.